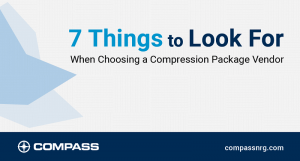 For buyers of compression equipment, the most challenging time often comes after the deal is signed and before the package is built. That’s when your vendor is behind closed doors doing the engineering work, so the package you chose will work for the situation you have. Weeks can go by, sometimes months, and suddenly you’re wondering: what’s going on? Is there a problem? Will these guys hit my deadline? To take these worries away, Compass decided to knock down some walls, open some doors and let the client in. The Compass engineering process is based on having highly experienced engineers using the best tools available. In-house communication software delivers instant messages to the responsible person, getting results far faster than email. Top-of-the line design and process simulation software, in tandem with the industry’s fastest ERP, means Compass engineers can meet or exceed client expectations for timely execution while maintaining the highest technical standards.